Harrowing, howling memories of the Holocaust have been recounted in many films, and they continue to resonate with audiences. This resonance was heard once again in The Pianist, originally released in 2002. This film won three Academy Awards and was re-released this year to mark the 70th anniversary of the end of World War II and of the liberation of Auschwitz. 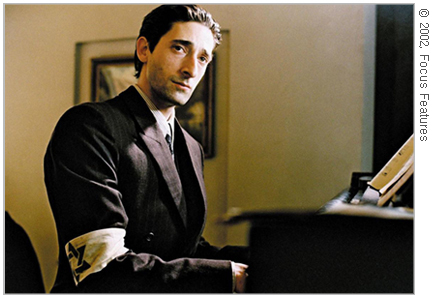 The Pianist is especially notable among films that portray the holocaust. 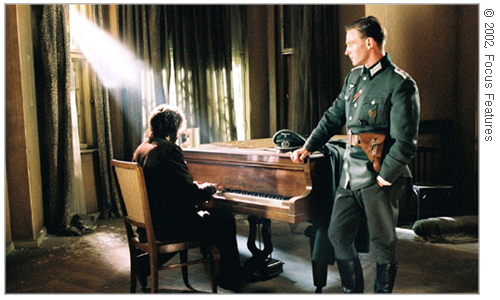 Based on the memoir of a pianist who survived the war, this film reflects the sentiments that were actually present in the midst of the tragedy: despair, strife, fear, and, despite all, the one remaining at the bottom of the box - hope. The movie begins with video recordings showing the streets of Warsaw in 1939. In the background, Chopin’s Nocturne flows, being played by Wladyslaw “Wladek” Szpilman, a famous Polish-Jewish pianist. Even before he finishes the five-minute piece, sudden shelling by the German military smashes the Polish Radio studios in which Wladek is playing. That was the last live music broadcast until the end of the war. The movie shows the ghetto as it was after Germany resettled the Jews, cold-hearted and pathetic. In the streets of the ghetto, a merchant has put barbed wire on her bread shelves. On the ground, a boy is calling for his dead father, sitting by his cold body, trying to shake him out of his sleep. Jewish police are there, watching their own compatriots. They are all Jews. Itzak Heller, a member of the Jewish police, is a key character in helping us to understand what the movie is about. Henryk, Wladek’s brother, regards Heller’s job as “beating up Jews and catching the Gestapo spirit.” However, Heller actually helps Wladek’s family in spite of Henryk’s reproach. Is he simply a bad guy who beats up his people? Heller saves Wladek when his family is being deported, thus saving his life. When he does so, we realize that the answer to that question is not so simple. It feels more complicated especially to a Korean audience, who may feel that Heller is juxtaposed with people who lived in Korea under Japanese rule. One after the other, the movie keeps showing the opposite sides of humanity. Jews and Poles help each other like comrades in arms, withstanding the rigours of Nazi German rule. A German civilian shouts a hateful scream at a Jew trying not to let him get away, just because he is Jewish. However, as is in the real world, the proportion of good and evil within a person is not determined by one’s nationality. The movie is quite neutral and realistic on this point. An old man in the ghetto snatches a can of food from an old lady. A Jewish boy is selling caramels even in the waiting area, where Jews are waiting to be deported to death camps. Twenty zlotys, the price he claims for a piece of caramel, was once all that Wladek’s family had. Despite his genuine sympathy, Wladek thinks of himself as no more than a powerless musician, and courage is not in his nature. He does not dare fight back, standing next to others. This collapse of stereotyping leads to a question: is there actually a good German, especially among soldiers? As we watch German soldiers insulting, beating, and killing Jews, we hesitate to answer yes. Nevertheless, in Nazi-ruled Warsaw, Wladek manages to meet a good German, a soldier. On August 1, 1944, to liberate the city from Nazis, the Polish Home Army starts a battle called the Warsaw Uprising. Battles start to tear down the streets, including the flat Wladek is hiding in, making him seek another haven. Running away from German soldiers, he climbs over the wall only to come back to the devastated ghetto, from which he desperately tried to escape. The scene is especially impressive since it shows what is left: nothing, no Jews, no Germans. 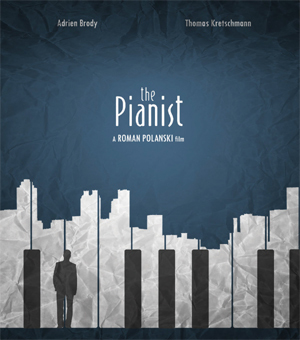 There, Wladek is caught by a man who plays the piano, and the man saves the pianist’s life. The man is Captain Wilm Hosenfeld, a dedicated officer of the German Army. When Hosenfeld enters the film, we hear him playing Beethoven’s Piano Sonata No. 14, which is widely known as the Moonlight Sonata. For a loyal German officer like him, it is natural to play a German composer’s piece. Then, what about Wladek? As the German officer is asking the Jew questions, we see, slightly out of focus, that there is a pistol at his side. Wladek has seen so many people shot by Germans, and now he is sure he is standing right in front of his own death, being asked if he is a Jew. Asked about his job, Wladek says, “Ich bin... Ich war Pianist [I am... I was a pianist].” And when the officer brings him to a piano and says, “play something,” he finds himself reinstated as a pianist. What is he supposed to play, for what may be his last recital? Should he play a German piece to win favor of the officer? He takes a seat, thinks for a moment. And then, he plays Chopin. The piece Wladek plays, Chopin’s Ballade No. 1, is one of the most passionate, masculine works written by the Polish composer. The ballade holds an inner fire, and Wladek does too by playing it. Music is the mode of conversation he is most accustomed to, and through it, he tells Hosenfeld what he has to. It is what he could not say to a German officer as a Jew, but to a man as a musician. Many in the audience may think that Wladek did nothing but run away until the end of the war. He did not. In the scene, he bravely stands against inhumanity ? not with a gun, but with music, doing his job as the pianist. Whether his recital was successful remains unclear because Captain Hosenfeld mentions nothing about it. He merely looks around Wladek’s hiding place and then leaves. After the officer leaves, Wladek barely exhales his suppressed cry. And what the German officer does afterwards is, to Wladek’s surprise, to bring food to the displaced. The Pianist shows a handful of tragic moments in a time of war and madness. People are so hustled by hardships that they step on the feet of others just to avoid falling. But, by helping Wladek to survive the war, Hosenfeld proves that a man, even in the hardest times, still can listen to what is to be heard. Grasping the hope, Wladek finally returns to Polish Radio, and the very first music he plays is Chopin’s Nocturne, the piece he was playing right there, six years ago. None of Szpilman’s family survived the war. Szpilman learned the name of the German officer, Wilhelm Adalbert Hosenfeld, in 1950 and strived to save his life but failed. In 2009, Hosenfeld was posthumously recognized as one of the Righteous Among the Nations by Yad Vashem, the official Holocaust memorial of Israel, for helping Jews during the war.